The ABI Research expects the count of Internet-enabled connected devices to reach 48 billion by 2021, of which one-third will include Bluetooth. This technology is revolutionizing how people experience IoT. Bluetooth technology is the global standard for simple and secure connectivity. This technology features in many computers, laptops, and smart devices, allowing them to securely communicate and share data over short distances via radio waves. The Bluetooth Special Interest Group officially announced the availability of Bluetooth 5 as the latest version of the Bluetooth core. This latest version is ready to meet the needs of a new generation of connected devices and assures faster data sharing with twice the speed and four times the range compared to the current version. It is expected to be available on smart devices from 2017. The primary updates to Bluetooth 5 include longer range, higher broadcast message capacity and faster speed for a variety of Internet of Things (IoT) connected devices. All smart home devices will be able to communicate over longer distances. This will enable new case uses of Bluetooth technology for industrial, outdoor and commercial applications. It will help IoT developers and users use more context relevant and improved solutions. It ensures that Bluetooth devices can coexist in complex IoT environment by reducing potential interference with other wireless technologies. This upgrade enables more robust, responsive and high-performance communication system including whole home and building coverage, which will allow the use of smart devices more than that permitted by the current version. It requires less power for functioning, which means, the device batteries will last longer before recharging or replacing. It also lets device makers adjust the device signal range and gives better security controls to them. The feature of longer range in Bluetooth 5 can cover large areas and reach over a kilometer. The improved speed and data capacity has the ability to transmit data packets at a speed of 2Mbps as compared to 1Mbps in the previous version. It is also backward compatible and hence users can go back to 1Mbps as per their requirement. The introduction of Bluetooth 5 will reduce complexity and improve flexibility in operating multiple applications and bring new opportunities across several verticals of the IoT market. The average number of connected devices in a company is expected to be more than 50 by 2020, which cannot be handled by the conventional Wi-Fi routers. Hence, Bluetooth 5 will be bridging the gap in organizations in the coming years. 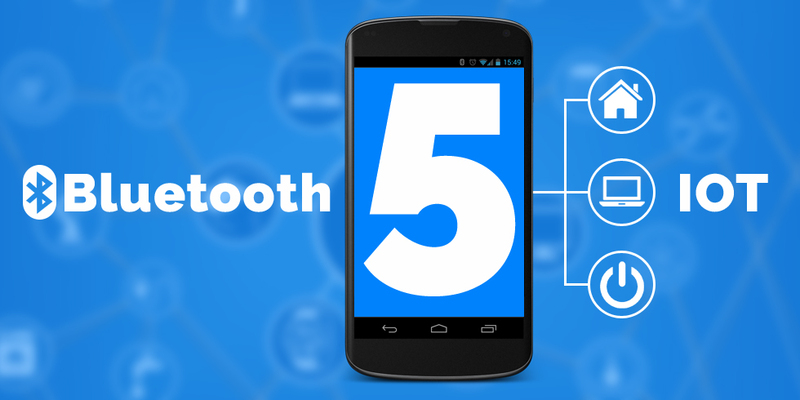 Bluetooth 5 is expected to hit the market in 2-4 months. Internet of Things has developed into a digital system that connects numerous isolated data in real time. Are you looking for an IoT solution provider to improve your company’s operational efficiencies and business productivity? Silver Touch brings to your doorstep the power of extensive Internet of Things Solutions. Write to us at info@semaphore-software.com with your requirements and our expert team will get back to you with the ideal solution.